Crown Publishing Group (NY), 9780804139519, 304pp. The true story of the U.S. Army's 240th Assault Helicopter Company and a Green Beret Staff Sergeant's heroic mission to rescue a Special Forces team trapped behind enemy lines during the Vietnam War, from New York Times bestselling author Eric Blehm. On May 2, 1968, a twelve-man Special Forces team covertly infiltrated a small clearing in the jungles of neutral Cambodia--where U.S. forces were forbidden to operate. Their objective, just miles over the Vietnam border, was to collect evidence that proved the North Vietnamese Army was using the Cambodian sanctuary as a major conduit for supplying troops and materiel to the south via the Ho Chi Minh Trail. What the team didn't know was that they had infiltrated a section of jungle that concealed a major enemy base. Soon they found themselves surrounded by hundreds of NVA, under attack, low on ammunition, stacking the bodies of the dead as cover in a desperate attempt to survive the onslaught. When Special Forces Staff Sergeant Roy Benavidez heard their distress call, he jumped aboard the next helicopter bound for the combat zone. What followed would become legend in the Special Operations community. Flown into the foray of battle by the 240th Assault Helicopter Company, Benavidez jumped from the hovering aircraft, ran nearly 100 yards through withering enemy fire, and--despite being immediately and severely wounded--organized an extraordinary defense and rescue of the Special Forces team. Written with extensive access to family members, surviving members of the 240th Assault Helicopter Company, on-the-ground eye-witness accounts never before published, as well as recently discovered archival, and declassified military records, Blehm has created a riveting narrative both of Roy Benavidez's life and career, and of the inspiring, almost unbelievable events that defined the brotherhood of the air and ground warriors in an unpopular war halfway around the world. Legend recounts the courage and commitment of those who fought in Vietnam in service of their country, and the story of one of the many unsung heroes of the war. 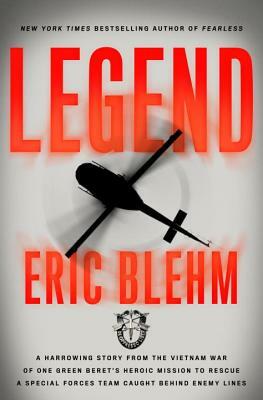 Eric Blehm is the bestselling author of Fearless: The Undaunted Courage and Ultimate Sacrifice of Navy SEAL Team Six Operator Adam Brown and The Only Thing Worth Dying For, which recounts the story of the first Special Forces A-team to infiltrate Taliban-held southern Afghanistan weeks after 9/11. Both titles were New York Times and Wall Street Journal bestsellers. His book The Last Season was the winner of the National Outdoor Book Award and was named by Outside magazine as one of the 10 "greatest adventure biographies ever written." Blehm lives in southern California with his wife and children.